The Luminor Marina immediately catches your eye with its distinctive design including a crown-protecting bridge and small seconds. It also maintains a stable value, making it a solid investment for watch lovers and collectors alike. You'll turn heads with a Luminor Marina on your wrist. There's almost no other luxury watch in existence with as distinctive a look as this Panerai timepiece. Its crown-protecting bridge, which pushes the crown down and creates a seal, is one unique feature. It also has a small seconds at nine o'clock, a feature which distinguishes the Marina models from all other Luminor Base models. The Marina movements are chronometer certified by the Official Chronometer Testing Institute (COSC). Luminor Base models only have two hands for hours and minutes, making the dial clean and legible. With luminous numerals and hands, these diving watches can also easily be used underwater, in the club, or at night. The name Luminor is inspired by the name of the luminous material used. The material is based on tritium and was patented in 1949. Panerai officially added the crown-protecting bridge in the mid-1950s; prior to that, it had only been available on prototypes. The design of these former military watches has remained unchanged to this day. 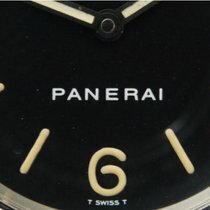 Panerai's consistency and uniqueness have undoubtedly contributed to their continued success and popularity. Additionally, Panerai's history with the Italian Marines has also increased the brand's cult reputation . These watches' large case size of over 40 mm mainly appeal to men. Actors such as Arnold Schwarzenegger and Sylvester Stallone have been Panerai fans for years and wear their timepieces both on and off the big screen. For example, in the 1996 film Eraser, Schwarzenegger wears a Luminor Marina in his role as US Marshal John Kruger. 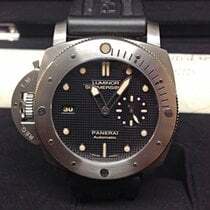 Stallone has also appeared in many films with a Panerai on his wrist; notably, he wore a Luminor 1950 Regatta Rattrapante in The Expendables (2010). While filming the film Daylight (1996) in Rome, Stallone purchased a Panerai and began wearing it. He was so enamored with the watch that he asked Panerai to create a limited edition version, the Daylight Slytech. It features an engraving of Stallone's signature on the case back. How much does a Luminor Marina cost? Prices for a pre-owned Luminor Marina in very good condition start at around 3,200 euros, while new, they cost at least 3,700 euros. This minimal price difference exhibits how the watch maintains its price after purchase. If you think you'll want to sell your Panerai watch one day, you should store the original strap safely after you purchase it and replace it with a different one. This will help you achieve the maximum sales price. The cases of these watches are traditionally made of stainless steel, though a few gold or titanium models are out there. Models with reference number PAM005511 have an 18-karat red gold case and 8-day power reserve. You should be prepared to spend around 15,000 euros for a new model. New titanium versions (PAM00564) cost around 5,000 euros. The 40-mm Luminor Marina Automatic Acciaio is significantly smaller than its sister model, which measures in at 44 mm. Thanks to its smaller case, the automatic watch is well-suited for thinner wrists. 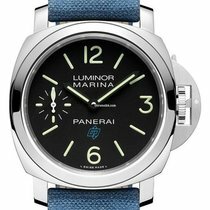 Prices for pre-owned models of the PAM00048 start at around 4,100 euros; new, they cost around 5,300 euros. If you find the 40-mm case too small, but still want an automatic timepiece, then the 44-mm version with reference number PAM00104 is a good choice. Pre-owned models cost at least 3,800 euros; new, they cost around 5,000 euros. The limited edition Luminor Daylight Slytech (5218-207A) is especially rare. This timepiece premiered in the pre-Vendôme era, before Panerai was taken over by the Vendôme Luxury Group in 1997. That same year, the Vendôme Group merged with the Richemont Group luxury goods concern. Thus, the Daylight Slytech is a real collector's piece which can cost between 20,000 and 35,000 euros. If you don't need a small seconds and want a clean, easy-to-read dial, then the Luminor Base Logo Acciaio is a good choice. There are versions available with a black dial (PAM01000) for 3,800 euros as well as with a white dial (PAM00630) for 3,500 euros. The model with reference number PAM00112 is especially sought after and rare. It's 44 mm in diameter and doesn't feature a logo on its dial. It's the prototypical Panerai watch that every Paneristi should have in their collection. Prices for a pre-owned PAM00112 start at around 4,000 euros; new, you should be prepared to spend at least 4,500 euros. Lovers of retro watches have found their perfect timepiece in the Luminor Marina 1950. Its cushion-shaped case resembles vintage watches of the 1950s. Unlike the watches in the Luminor collection, which have a slimmer profile, the Luminor 1950 timepieces have more defined curves leading up to the lugs. Furthermore, "REG. T.M." (registered trademark) is engraved on the upper side of the crown-protecting bridge. No other Luminor model has this engraving, but rather simply a polished bridge. 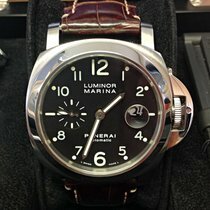 A pre-owned Luminor Marina 1950 (PAM00312) costs around 5,000 euros. New models cost around 5,700 euros. 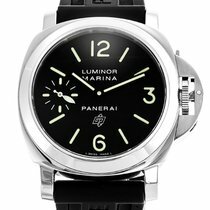 Panerai produces Luminor Marina models with both manual and automatic calibers . All models feature a decentralized seconds at the nine o'clock position. The manufacturer uses the calibers OP II, OP XI, and P.5000 for the manual models. The OP II and OP XI movements are based on the caliber Unitas 6497-A2. The OP III movement, based on the Valjoux 7750 caliber from ETA, powers the automatic models. Unlike the 7750, it does not have a chronograph function. However, it does have a date display at the three o'clock position. Panerai's P.5000 caliber is 4.5 mm thick and measures 35.1 mm in diameter. It was consciously designed to be stable and robust and is comprised of 127 parts, 21 of them gemstones. The balance wheel vibrates at 21,600 alternations per hour, which is equivalent to a frequency of 3 Hz. Thanks to its two barrels, the movement has a power reserve of eight days. The Parechoc from KIF serves as shock protection. The design of the three-handed Luminor has remained consistent over the last 60 years. The watch is impressively functional and easy-to-read, necessary qualities for a watch designed to withstand the tough tests conducted by the Italian Marines. The dial is available in white, black, and brown. Fluorescent Arabic numerals are at the twelve, three, and six o'clock positions, while the small seconds is located at the nine o'clock position and glows brightly. Panerai uses line index markers for the other hours. The band is available in stainless steel, calfskin, or alligator leather. Since you can quickly and easily switch straps, you can change the look of your watch whenever you desire. The Luminor Marina is no longer just a military watch. Actors such as Sylvester Stallone and Arnold Schwarzenegger have brought this watch to the big screen. Thanks to its water resistance up to 300 m, it's perfect for using in and around water. Today, managers, city dwellers, and creatives alike all wear this piece of history on their wrist. There isn't another watch out there that is as recognizable as the Luminor.